Eblana’s Single Mode Lasers are used extensively for high sensitivity detection of gases such as Carbon Dioxide (CO2), Methane (CH4), Ammonia (NH4) and Hydrogen Fluoride (HF). Eblana’s DM technology platform delivers unrivaled wavelength uniformity and stability which is critical for these applications. 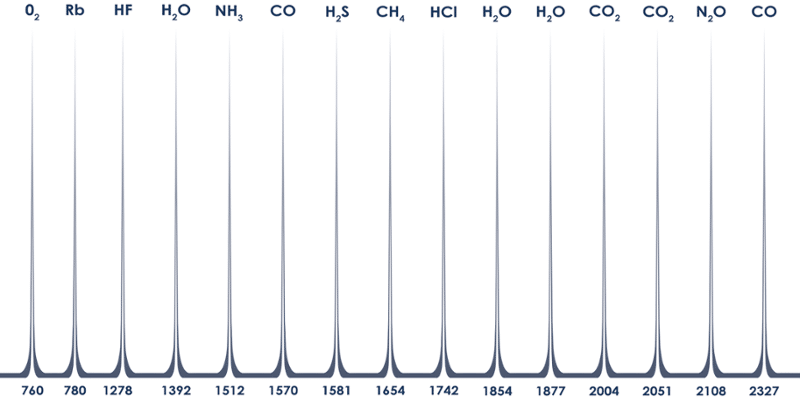 Here are some of the most requested gases and the wavelengths needed. Precision single mode lasers from 689nm to 2350nm built on the world’s most cost-effective technology platform.